Smart Elbow deflection elbows preclude abrasive resins from impacting the elbow wall, preventing fines, angel hair, streamers and elbow wear. 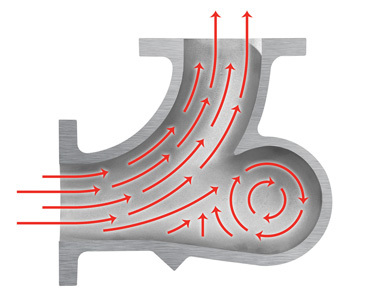 The vortex chamber of the HammerTek deflection elbow protrudes partially beyond the 90-degree flow path, causing a sphere of material-in-air to rotate in the same direction as the air stream that powers it, gently deflecting incoming material around the bend without impacting the elbow wall. 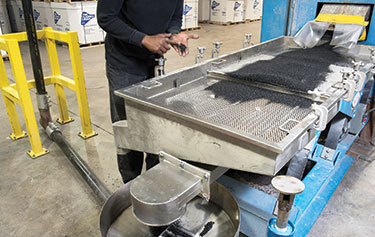 Plastic pellets skidding against the outside radius of conventional sweep elbows create friction and heat that can melt pellet surfaces, forming streamers and angel hair. The Plastics Group replaced conventional sweep elbows with HammerTek deflection elbows, none of which has needed replacing. By preventing material impact with the elbow wall, the company has prevented elbow wear, the generation of fines and the frictional heat that previously caused the formation of angel hair and streamers. 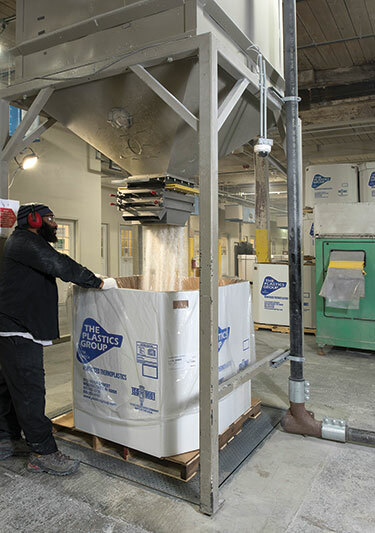 The Plastics Group conveys approximately 3,300 lb (1,497 kg) per hour of reinforced resins through two pneumatic lines, and between 1,200 to 1,500 lb (544 to 680 kg) per hour through a third line. Abrasive reinforced polypropylene resins caused wear and failure of traditional long-sweep pneumatic elbows. Impact of material against the elbow wall also created fines and frictional heat that partially melted the resin. WOONSOCKET, RI — At The Plastics Group of America, pneumatic conveying of reinforced Polifil® polypropylene compounds caused 90 degree sweep elbows to fail monthly, a problem the company solved by installing Smart Elbow® deflection elbows from HammerTek Corp.
Ed Joanis, maintenance director, says the company’s proprietary resins, reinforced with up to 40% glass fiber and minerals such as calcium carbonate and talc, were wearing away the elbows, whose 90 degree angles created impact points for the pellets traveling through the lines. "The impact of the abrasive resins hitting the inside walls of the elbows at high speed not only created fines, but heated the elbows, causing pellet surfaces to melt and form angel hair and streamers, creating quality issues downstream in our compounds,” he explains. It was costing the company one hour of downtime to replace each of the six elbows, along with labor costs. The price of buying 72 or more elbows a year, moreover, ran well into the tens of thousands of dollars. To avert these problems, the company replaced six 90 degree sweep elbows with the deflection elbows — two per line. The Smart Elbow design incorporates a spherical vortex chamber that extends partially beyond the 90 degree flow path, causing a ball of pellets to rotate in the same direction as the air stream, gently deflecting incoming pellets around the bend. 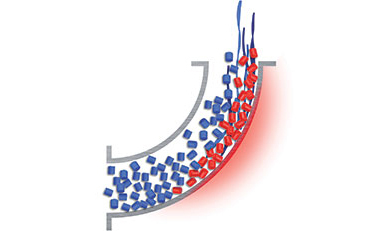 In addition to preventing pellets from impacting the elbow wall, the vortex chamber causes the material to exit the elbow evenly and return rapidly to a laminar, steady-state flow within the conveying line. The airstream sweeps the vortex chamber clean after the material feed is shut off. 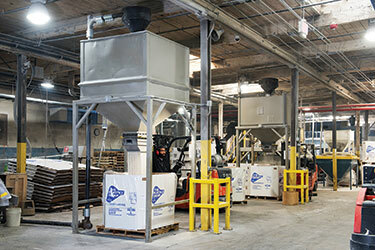 "None of the deflection elbows has needed replacing after being installed in May 2013 eliminating the cost of replacements, labor and downtime," says Joanis, adding, "The gentle deflection action also reduces the formation of fines, dust and angel hair, improving the quality of our compounds and finished products." "Maintaining structurally sound elbows also minimizes potential injury due to blowouts and material spills," he adds. 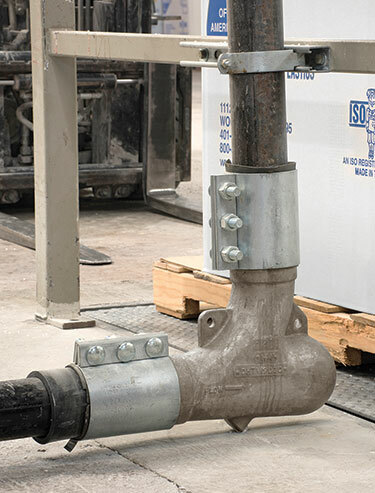 The Smart Elbow replacements are cast of ductile iron and measure 18 x 18 in. (46 x 46 cm) x 3 in. (7.6 cm) in diameter. 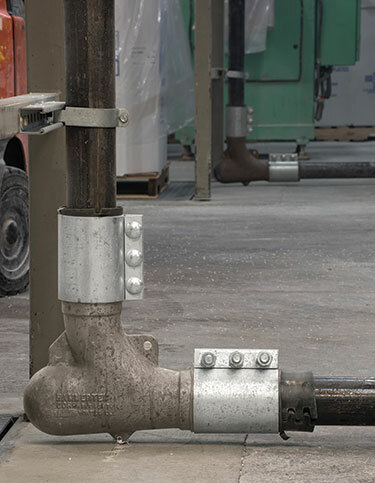 The elbows cost more than the sweep versions they replace, Joanis acknowledges, but yield a rapid return on investment due to long life and reliable performance. 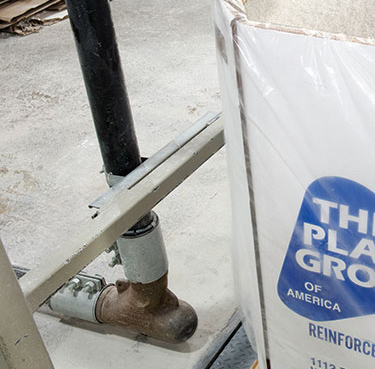 The Plastics Group conveys about 3,300 lb (1,497 kg) per hour of reinforced resin through two of the lines during compounding operations, and 1,200 to 1,500 lb (544 to 680 kg) per hour through the third line. 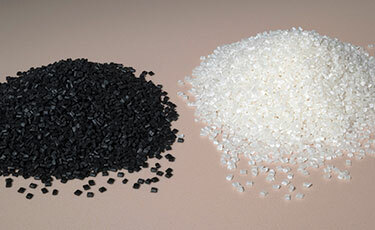 These resins and others (including reprocessed materials) used in the company’s Polifil compounds end up in a range of consumer and industrial products. The compounder began operations in 1973 in a small plant. It now processes materials in a 250,000 sq ft (23,225 sq m) facility, and plans to add another material conveying line that will also be equipped with Smart Elbow deflection elbows.